Ready for you or your bridesmaids on your wedding day. Set of 5 Swarovski crystal pearl hair pins add charm and elegance when you tuck them into your updo or nestle them in your soft braid. Lovely new color from Swarovski - iridescent Tahitian Look is a deep green blue crystal pearl. It was difficult to capture the true color in the photo. It’s slightly more green than blue. A beautiful choice for the bride, bridesmaids, or anyone wanting to add some classic charm to your hairstyle. Each bead is attached to a 2 inch gripping bobby pin with wire wrap styling. Select your bobby pin and wire color during checkout. Need more for your bridesmaids? Different pearl color combinations? Please ask, as I'm happy to customize these for you. 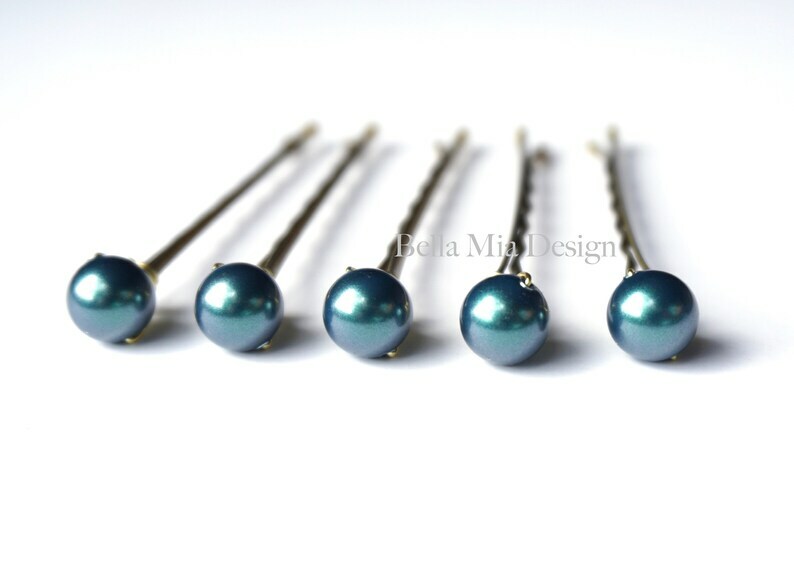 (5) hair pins with 8mm Swarovski crystal pearl beads in Tahitian. Swarovski's quality pearl beads start with a unique crystal core that is covered with an innovative pearlescent coating for a flawless, silky-smooth surface which resists cosmetics, chemicals and perfumes.